I am completely confused. Is their a form for the affidavit? What types of things needs to be written in it? How long should it be? Does it come from a family member or non family member? It is very ambiguous. Any info on the affidavit would be much appreciated. Thank you. There are no affidavits required for the RoC. "If you are short on the documents that have both of your names listed on them you MAY include affidavits from people who know you as a couple (see examples), confirming your marital relationship -- note that they are not required. If you have very little documentary evidence, you may find affidavits helpful." 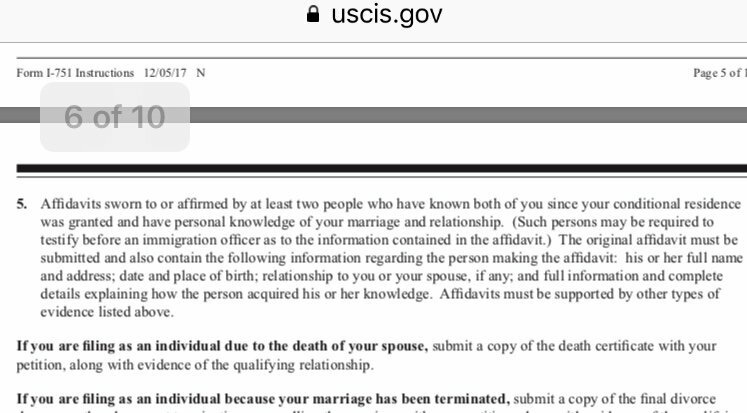 It doesn’t say it’s optional on the USCIS website? Just curious how you are coming to that conclusion that it’s optional? It doesn't say it is required......therefore, it isn't. I came to this conclusion because I didn't submit any and yet I was approved. Just like majority of people who do ROC, they probably don't bother with affidavits because comparing to other "evidences", they hold very little value. As of 2019 it is required, which is why I asked about it. Nothing there says that affidavits are required. Those are examples of evidence.....by, if it makes you feel better, then send them. The VJ guide for ROC has examples. It doesn’t hurt to add them, especially if you don’t have other pieces of evidence, but like noted above, they aren’t a strong piece of probative evidence. As for form, there isn’t any right or wrong way to do it. After that number each statement the person is making. At the bottom have a signature line, with their name typed below it. You can go one step further and add a jurat for a state notary public. “Sworn or affirmed before me this 1st day of April 2019. Add another signature line with Notary Public below it, and the have a notary stamp it (usually banks will have a notary on staff and it’s free - or ups has it for a charge, which depends on your state as each state has maximum costs that vary - for instance in NY, I cannot charge more than $2 to notarize a document). Again, don’t stress over providing affidavits, because if you have the other more quality evidence (taxes, banking, insurance, lease/mortgage, etc) they probably won’t even glance at them. 1. Instruction is from 2017. Since then many people successfully did ROC without any affidavits. 2. No where does it say that the document is required. Following this logic people who don't have a mortgage or children together (point 1 and 2 of said instruction) would not be approved for RoC since they can't provide those. Instruction just give you examples of what kind of documents you can provide. Not required but you can send them in if you want. It can be from family members or friends (or both). Just make sure to get them notarized and follow exact instructions for that. FYI I did not include any affidavits. Word on the street is that they are considered a very weak form of evidence. We included some to be overly thorough, and also to amplify some other evidence. On the whole though, evidence of living together and mingling finances is really what's required. My husband and I included one from his parents confirming that we lived with them for six months. However, we only did this for continuity purposes to show that we were living together the whole time, so the 6 month gap between our leases would not be questioned. Other than that , we wouldn't have bothered and I was approved with no RFE. I'm from the UK, hubby is from Michigan and is a retired US Army Officer. We are currently stationed overseas. The journey to ROC starts here...! Never included any in our I751 package because they are not very useful because no one is going to submit any negative ones. We had no RFE and approved. To comfort yourself, just file your form with an Affidavit of Support, it does not hurt anyway. I would rather do some extra steps and then leave the worry behind - then feel uncomfortable after. It does not mean other people are not right.